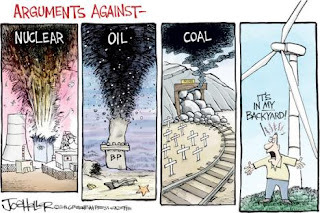 Ontario Highlands Friends of Wind Power: Where are wind-energy opponents' alternatives? Where are wind-energy opponents' alternatives? I would like to compliment you on Owen Roberts’ column from Monday: Wind Energy Predictions in Ontario Hit New Highs. It attempts to lay out facts and points of view with balance and objectivity for a subject that is very much on many tongues these days. The one area which all interested parties have been unable to discover to date is the reasoned alternative that opponents would recommend as their energy mix for Ontario’s future, say for the next 20 years or so. I believe all parties would benefit from this disclosure, which should be in sufficient depth to disclose full real lifetime costs and impacts for each energy type, including subsidies attached to each energy type, estimated using a consistent pricing model along with the pros and cons of each energy. From this, Ontarians might be better equipped to contribute to this critical matter. For greater clarification, I’d like to see recognized items such as the following: the price of energy for each type, and comments on their risk, given events outside Canada, which could impact them. I’d like to see recognition that health costs associated with fossil fuels (deaths and independently verified annual costs) be added to the costs of that type of energy. Further, carbon cost attributions should be estimated, along with any assumptions about “clean coal” and its costs and risks, as appropriate. Also, I’d like it acknowledged that nuclear energy comes with a number of encumbrances not currently included such as the debt retirement charge, which has not yet been expunged. Without government underwriting, this industry is unlikely to be insurable or financeable independently. To date, the Ontario industry record for on-time-on-budget for either a new nuclear plant or major overhauls has been appalling. In addition, there still isn’t any permanent solution to the spent fuel disposal issue, which is growing daily. What are the operating risks and security costs related to this form of power generation? What is the impact that Ontario’s inflexible nuclear technology has on the sale of surplus base load power into the spot market, especially since major decisions on nuclear expansion are imminent? Finally, we need to be discussing how Ontario’s grid infrastructure is in dire need of upgrading and modernizing after years of neglect; this is regardless of fuel but a significant capital investment.